The Society of Collision Repair Specialists on Tuesday announced it had formally launched its 401(k) program for member companies, an initiative that could help smaller auto body shops compete with larger rivals on benefits. SCRS and partner HR services firm Decisely have developed a program which allows multiple small businesses to team up and spread the cost of a 401(k) among each other. “They’re quite expensive,” especially for small businesses, Decisely marketing Vice President Diane Peoples said in 2018. She said the savings can be as much as 50 percent of the 401(k) fees to an employer. 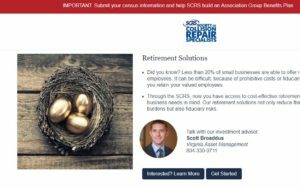 Virginia Asset Management partner Scott Broaddus has been tapped as the investment advisor for the plan and participating SCRS members. His company will also offer members with existing 401(k)s or simple IRAs a free cost and investment options analysis. SCRS said collision repairers could also save administrative liability and time by using its 401(k) option. As former SCRS Chairman Andy Dingman (Dingman’s Collision Center) observed during the organization’s open board meeting Tuesday, his company has grown from offering a simple IRA to a 401(k) with fiduciary responsibility on the plan provider. He called the latter a “really big benefit” to his shop, for it offered an additional layer of Employee Retirement Income Security Act compliance protection. In terms of saving time, the program allowed small shops without any full-time HR employees to delegate retirement-related tasks to a third party. Without such a partner, the shop owner or another employee would have to handle those items along with their other responsibilities. If your shop already offered a retirement plan or was considering doing so, “this is such a great opportunity,” Dingman said. The option to combine forces on 401(k)s had already existed for small businesses in general, but it received a boost in October 2018 when the Trump administration announced a proposed Department of Labor rule regarding Association Retirement Plans and 401(k)s offered by Professional Employer Organizations, which are companies that contract to handle some human resources duties for other businesses. Decisely CEO Kevin Dunn at the time said the Labor Department had opened an “aperture” to make it easier for collective plans. 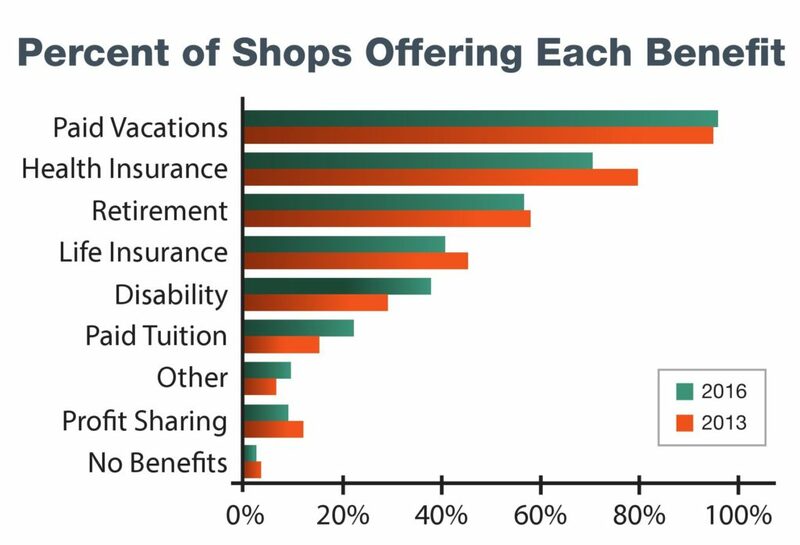 Even if you don’t use SCRS’ option, some sort of retirement plan could be crucial to a small shop which wants to stay competitive with local, regional or national MSOs. Nationwide, 45 percent of all private businesses with fewer than 50 staffers offer retirement benefits, according to the Bureau of Labor Statistics. However, 75 percent of businesses with 50-99 employees, 88 percent of businesses with 100-499 employers, and 94 percent of companies with 500 or more workers offer retirement. “Benefit packages offered to today’s collision repair technician workforce show little change from previous survey data, except for a significant decrease in health care coverage,” the two organizations wrote. Retirement could be increasingly attractive to an industry that appears to be graying. The CEO of Gerber Collision’s parent company reported in March in March that the company’s normalized same-store sales jumped 5.2 percent in the fourth quarter of 2018. Boyd Group CEO Brock Bulbuck indicated a major factor was also the company’s progress on its technician shortage. The company has a backlog of work that simply can’t be converted to sales if it lacks the techs to do the repair and get paid. The Boyd Group, which owns Boyd Autobody, Gerber Collision and Assured Automotive, last year put half of the projected $11 million CAD savings from the U.S. tax cuts into better benefits for its technicians. It increased vacation and holiday pay for commissioned repairers, and it doubled its employer match and shortened vesting on repairers’ 401(k)s.
“We’re not out of the woods” on the tech shortage, but the Boyd Group made enough progress to post the kind of results it did in the fourth quarter, Bulbuck told analysts on an earnings cal.